Final Fantasy Marathon for ACT starts today! TheSpeedGamers are a not-for-profit charity organization that holds gaming marathons, usually in 72-hour or week-long increments, to benefit other charities. The organization was founded in March 2008 and has held 28 marathons and raised $393,240.65 for nearly 20 different charities. In their upcoming week long marathon, from 24 June to 1 July, they will be revisiting one of their most successful marathon series, Final Fantasy. All donations raised in this marathon will go directly to ACT (Autism Care and Treatment) Today!, a charity whose mission is "to raise awareness and provide treatment services and support to families to help their children with autism achieve their full potential." 2 July: The Final Fantasy Marathon has ended and they have raised ~ $32.6K for ACT Today! Square Enix has announced that Dragon Quest X: Rise of the Five Tribes Online, the MMORPG which was released last year on the Wii and 3 months ago on the Wii U, will also be released on PC on 26 September. They've also released a benchmark and you can sign up for the beta (if you can read Japanese). The normal version will cost ¥3990 and and a Special Edition which comes with a controller and token will cost ¥9800. Sadly no Western release has been announced yet. The E3 2013 has ended a couple of days ago and man what an announcements have been made by Square Enix and other companies. Here's a wrap up of this years E3 with the big announcements Square Enix made. Square Enix's total rebuild MMORPG will also be released on the PlayStation 4 in 2014. A new trailer and gameplay footage has been released and three new classes have been announced: Arcanist, Scholar and Summoner. Beta Phase 3 has just started last Friday and for the first time PlayStation 3 owners can participate. Rumors were spreading for months, but it finally was officially announced at Sony's press conference. Final Fantasy Versus XIII has been renamed to Final Fantasy XV and will be released on PlayStation 4 and Xbox One and is no longer exclusive anymore. New footage was released and at Square Enix Presents Tetsuya Nomura said that 1 to 2 years after the annoucement of Final Fantasy Versus XIII (that was back in 2006) there were long discussions of renaming the game to Final Fantasy XV, because of the scale and concept of the game. First footage was seen of Kingdom Hearts III showing a mature Sora on Destiny Islands and in Twilight Town fighting a horde of heartless. The game is in development for PlayStation 4 and Xbox One. During Square Enix Presents, where Tetsuya Nomura appeared as a guest to talk about Kingdom Hearts HD 1.5 ReMix, Kingdom Hearts III and Final Fantasy XV, viewers could get their first look to the battle gameplay of Final Fantasy XV. Now the trailer has gone live! More trailers coming up! This time Square Enix has released the E3 trailer of Kingdom Hearts HD 1.5 ReMix which will feature Kingdom Hearts: Final Mix, Kingdom Hearts: Chain of Memories and Kingdom Hearts: 358/2 Days (cinematic only). It will be released in North America on 10 September and Europe on 13 September. At the 'Future of Final Fantasy' event Square Enix has announced that their MMORPG Final Fantasy XIV: A Realm Reborn will be released on PlayStation 4 next year. Accounts can be transfered from the PlayStation 3 version to PlayStation 4 version when it is released. Square Enix has also released the E3 trailer of Final Fantasy XIV: A Realm Reborn called 'Crystal's Call'. Square Enix has released the E3 2013 trailer of Final Fantasy X/X-2 Remaster, the HD versions of Final Fantasy X and Final Fantasy X-2. In the trailer you can see in-game footage of Final Fantasy X, including the battle system. The game is set to release this year for PlayStaion 3 as Final Fantasy X/X-2 Remaster and seperate games for PlayStation Vita. The moment a lot of fans have awaiting for is finally here! After the new trailer that showed that Final Fantasy Versus XIII will be re-branded to Final Fantasy XV, Tetsuya Nomura showed a short teaser for an upcoming title. When the Disney Interactive logo was shown everybody knew it: Kingdom Hearts III is in development for PlayStation 4 and Xbox One! Kingdom Hearts III reunites us with a mature Sora after the events of Kingdom Hearts II. Having learned that all the conflicts surrounding “Kingdom Hearts” were a part of Master Xehanort’s master plan to cause a Keyblade War, Sora and his friends search for the seven guardians of light to combat the darkness. Final Fantasy Versus XIII becomes Final Fantasy XV! After months of rumor it's finally official! Final Fantasy Versus XIII has been re-branded to Final Fantasy XV! During Sony's E3 press conference that was showed previous night, Tetsuya Nomura, director of the game, had a video message showing the new trailer of Final Fantasy XV and said that more game details will be announced in the upcoming days. Final Fantasy Versus XIII was originally announced as an exclusive PlayStation 3 game back in 2006, but is not an exclusive game for the PlayStation 4 anymore. It will also be released on the Xbox One. A release date has not been announced, but according to Square Enix the game is not expected this financial year (ending 31 March 2014). Lightning Returns: Final Fantasy XIII will be playable at the E3 that will start tomorrow. Just before the start Square Enix has released a new trailer of the demo that takes place in the newly revealed city of Yusnaa where Lightning is chasing Snow and is being ambushed by Lumina. This Tuesday morning at 09:00 hours PDT (16:00 hours UTC) Square Enix holds a pre-E3 event that will be about the 'Future of Final Fantasy'. The available press will get some Q&A time with senior vice president Shinji Hashimoto. It seems likely that a new Final Fantasy will be announced, which Shinji Hashimoto mentioned last February at Sony's press conference where the PlayStation 4 was announced. Or maybe finally some information about Final Fantasy Versus XIII? Square Enix has revealed the E3 2013 trailer of Lightning Returns: Final Fantasy XIII showing returning characters and gameplay from the final game in the Lightning saga. They have also announced that the game has been delayed and will now be released in North America on 11 February 2014 and Europe on 14 February 2014 instead of this year. 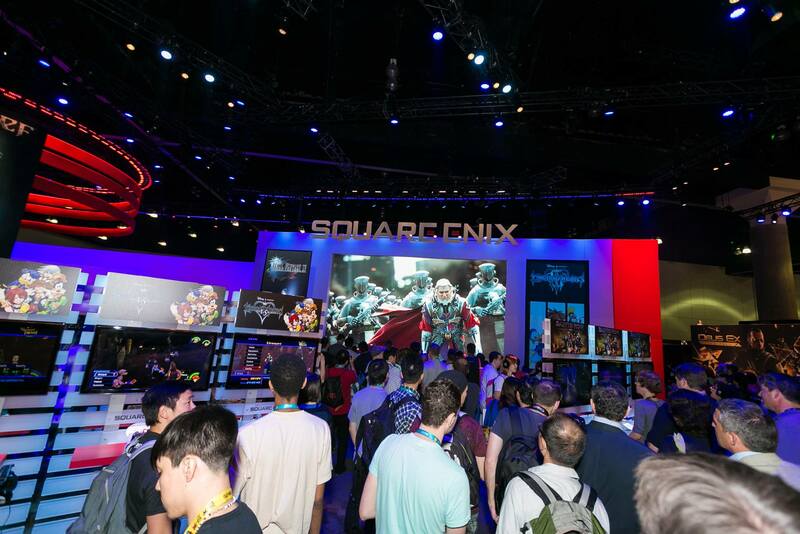 With only 9 days to go till the E3 2013 starts in Los Angeles, Square Enix has released the first E3 update on their Square Enix Presents YouTube channel. Square Enix Presents will show exclusive announcements and presentations during the E3 and will be hosted by Megan Marie (Community Manager at Crystal Dynamics). Guests that have been announced are Naoki Yoshida (Producer Final Fantasy XIV: A Realm Reborn), Yoshinori Kitase (Producer Lightning Returns: Final Fantasy XIII) and Motomu Toriyama (Director Lightning Returns: Final Fantasy XIII). Hopefully a new Final Fantasy game will be announced or finally information about Final Fantasy Versus XIII (rename to Final Fantasy XV? ).